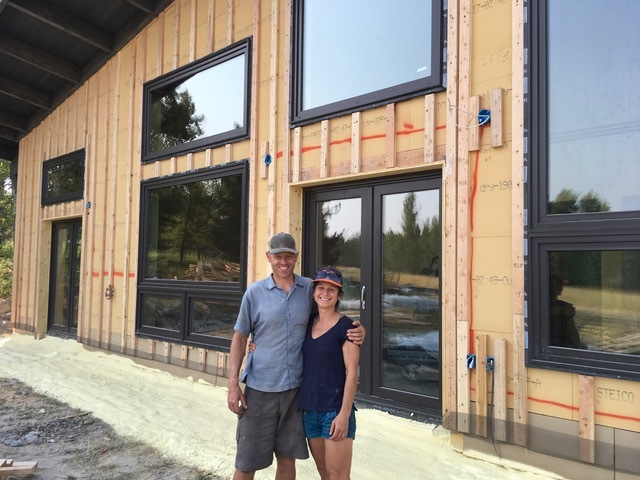 Yvonne May and Jack Christiansen are building a super-efficient home constructed with European-style cross-laminated timbers. This is Home 31 on the October 13 Green Home Tour. Visit three homes in the Whitefish area that feature innovative, energy efficiency, and sustainable design. Learn about cutting-edge building materials, how to dramatically reduce energy costs, and opportunities to generate your own power. This event is free. Lunch will be served at Home #3. Please RSVP by October 12 by contacting Karin Hilding, Climate Smart Board Member and Project Engineer at the City of Whitefish: khilding@cityofwhitefish.org or 406-863-2450. Meet at the Center for Sustainability and Entrepreneurship next to Whitefish High School (1141 4th Street) at 10:45 am to carpool to the three homes or join us at Home #1 at 11 am. Home #1 – 11 am: Cross-laminated timber home built and designed by owners Yvonne May and Jake Christiansen. Their home utilizes European-style engineered wood using small-diameter logs. It features triple-paned window and is an energy efficient home built with virtually no construction waste. Location: Lamb Lane off of Karrow Avenue. Click here for more background info. Home #2 – 12 pm: Energy-efficient green home built by Mark Van Everen and Bridgewater Builders. 325 Sawtooth Drive in Whitefish. Learn more about Mark’s business here. Home #3 – 1 pm: Zero-discharge home built by owner Richard Cohen. Featuring solar power, solar thermal water, super-insulated efficiency, composting toilet, and grey water treatment for irrigation of greenhouse beds. Location: 160 Kallner Lane. Lunch will be served to tour participants at Richard’s house, sponsored by Climate Smart Glacier Country. Wrap-Up – 2 pm: Carpool back to the Center for Sustainability and Entrepreneurship for a brief wrap up. For a summary of the event, please see below.